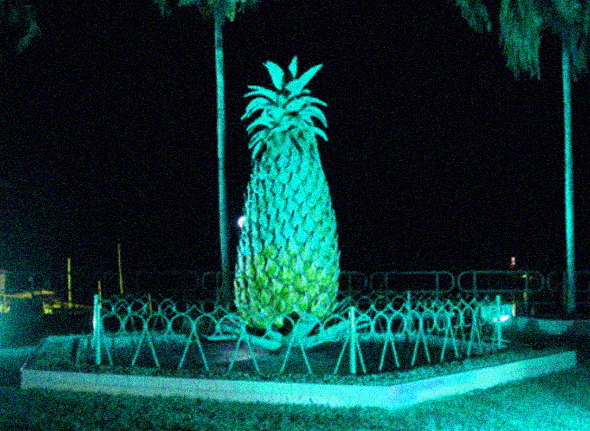 Here’s episode 102: Moonlight Pineapple, recorded on the Noa Noa back porch on April 6th, 2011. We organized this show around Charlie and Chris Rauh’s visit back to Nashville from New York City and DC respectively. We did two improvs that night, the first with a set group of participants, and the second, a free for all tag team with a who’s who of the Nashville avant garde music community. Episode 101 featured the first. You’re about to hear the second. Since this was nearly two years ago and it featured so many people, to be honest, I can’t completely remember everyone who played on it. But I’m pretty sure that it featured Randy Hunt, Rhendi Greenwell, Tim Norton, Charlie Rauh, Chris Rauh, Sarah Robey, Chris Murray, Craig Schenker, Jamison Sevits, and Tommy Stangroom. I apologize if I forgot anyone. I did the recording, live mixing, editing, and mastering. The idea for this was that any participant could walk off at any time and tag in someone in the audience to replace him or her. There are some really nice moments on this. Thanks for listening!